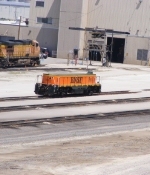 Title: BNSF 6361, 3965 sit near the shops at Galesburg, Il. Description: Nothing doing in the yard. Description: Still here.....Cracked frame and all. Description: This guy was on its way to be scrapped when one of the yard crews pulled out the drawbar.